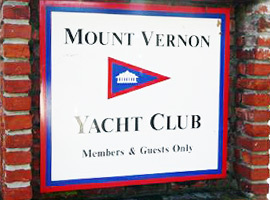 Mount Vernon Yacht Club (MVYC) is a neighborhood-based social club located near George Washington’s Mount Vernon Estate just south of Washington, DC. Some people think a “yacht club” is only for boaters, but MVYC has something for everyone, every month of the year! Boating members enjoy our 100-slip marina (38 42 6.2 N 077 07 2.5 W) with convenient access to Dogue Creek and the Potomac River. This sheltered, fresh-water facility can accommodate boats up to 50 feet, with most slips at 30 feet and smaller. The location is only 8 miles from Alexandria, and just 90 miles from the Chesapeake Bay. The marina is a center for constant activity during boating season, including frequent floating parties, sail races, overnight cruises and longer voyages. MVYC also has a full-size, 25-meter swimming pool with wading pool and diving board. Another important feature is the three-story clubhouse that offers a large multi-purpose room with an adjoining bar, a meeting room and a member’s lounge. A wrap-around deck provides spectacular views of the pool, marina, Dogue Creek and the Potomac River. “The Point” is a grassy area located at the water’s edge where the Club’s yardarm, with flags flying, sets the scene for frequent picnics and other gatherings. Our active social calendar is just as important as our facilities. MVYC members are like a large, extended family. The club hosts an active swim team, a power fleet, a sail fleet, and many other activities and social events year-round. Almost every Friday, members gather for informal pot-luck dinners at the clubhouse. Almost every month, we also hold larger parties such as our annual New Members Party, St. Patrick’s Day Party, and Oktoberfest. And we hold two formal events each year: Commissioning Day and our black-tie Commodore’s Ball (change-of-watch ceremony). MVYC was organized as a nonprofit corporation in 1956. Its activities are governed by its Article of Incorporation, Bylaws and Club rules. A Board of Trustees, elected annually, conducts the business of the club. We hold monthly Membership Meetings to keep members informed. MVYC also issues a monthly newsletter – The Beacon. At its heart, MVYC is a volunteer organization. We only use paid staff for the pool and for yard maintenance, which helps us keep costs low. Volunteers staff our Board of Trustees, our committees, and our social events. MVYC – anchoring the Yacht Haven Estates community since 1956!